As virtually any parent will tell you, children, especially young children, love to ask questions. In fact, depending on the exact study that you cite, the average preschool-aged child will ask anywhere from 100 to 288 questions over the course of a single day. On the high end, that’s roughly equal to one question asked every two and a half minutes! However tedious it might seem to be a parent in the moment, being bombarded by a question every two and a half minutes, asking those questions plays an important role in your child’s development. It’s by asking those questions—who? what? when? where? why?—that a child is able to explore and learn about the world around them, build connections, develop a sense of creativity and curiosity, and more. Unfortunately, by the time most children begin approaching middle school, the number of questions that they ask tends to dramatically decrease. It is little wonder that this is also the time that standardized testing tends to take a more central role in most children's education. Between strict lesson plans, an emphasis placed on memorization, and classes with too many students, there often isn’t enough time or resources available for many teachers to encourage their students to ask truly meaningful questions. The ability to ask deep, meaningful questions is an important skill for children to develop and learn—and one that they’ll leverage throughout their careers and their lives. But it is a skill that they will need to practice regularly if it’s something that they’re going to retain. Below, we discuss some of the ways that parents can help their young children learn to ask the questions that truly matter. What makes a meaningful question? When children are young, every question has the potential to be a meaningful one, opening them up to a new and wonderful discovery about the world in which they live. But while all questions have the potential to be meaningful, the most impactful questions tend to be the ones that go beyond a simple answer in search of something deeper. For example, questions such as what?, when?, and who? often have fairly straightforward answers that are tied to information recall or memorization. Given enough background knowledge or resources, these questions can be definitively answered fairly easily. Questions like why? and how?, on the other hand, go beyond simple recall. Answering these questions takes a deeper sort of understanding, often requiring children to make observations, draw conclusions, or otherwise synthesize multiple sources of information. It is these questions that parents should especially encourage their children to ask—and answer—in order to develop truly strong critical thinking skills that they can carry throughout their lives. Parents who want to help their children become more comfortable asking more meaningful questions have a number of strategies at their disposal. Below are some of the most effective methods for young children. 1. When your child asks you a question, answer them—and then ask one of your own. In addition to modeling an important skill (asking questions), your prompting will also give your child early practice in answering abstract questions that require critical thinking skills. 2. Use your child’s love of books to your advantage. Most young children love books. They love it when you read to them, they love it when they read along, and eventually, they will love to read on their own. You can use that love of reading to your advantage to help your child develop a level of comfort around asking questions. When your child is young, read to your child books that either contain an abundance of questions or are built around questions in order to help your child become familiar with the process of asking different kinds of questions. Titles like Are You My Mother?, the Kids’ Book of Questions, What if Everybody Did That?, and Little Kids First Big Book of Why are often popular choices. Why do you think the character reacted this way? How might you get out of a problem like this one? 3. Frame questions as discussions. One of the reasons that children often tend to stop asking questions is because we, as a society, place a lot of importance on being right. Asking questions shows vulnerability and weakness; knowing an answer shows intelligence and strength. But this is exactly the wrong way to think about questions. Instead of being a sign of weakness, it is the act of asking questions—and working to solve them—that allows us to learn. By framing questions as discussion and exploration, you can help your child understand that it isn’t about being right or wrong: It’s about discovering the answer and constructing knowledge, often through trial and error. While parents can do much to help their children develop a sense of curiosity and passion for asking meaningful questions that they’ll carry throughout their lives, it is important that these skills are regularly practiced. 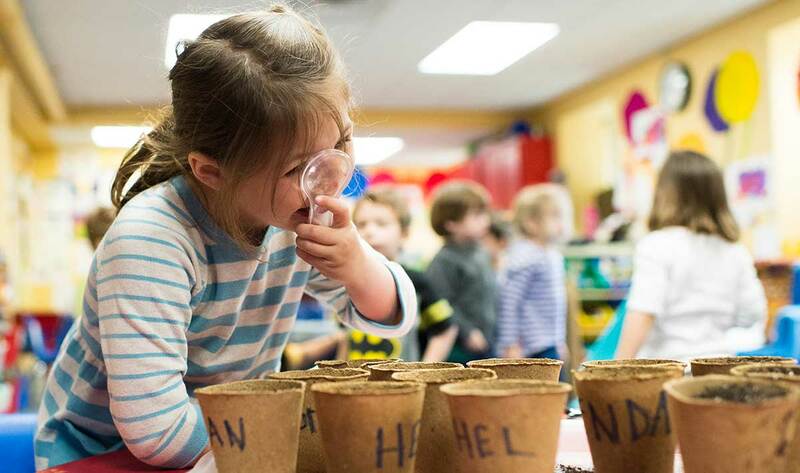 Enrolling your child in a school that similarly prioritizes creativity, curiosity, and asking questions can help you reinforce these lessons throughout your child’s entire education.